Issued by the Alumni Relations Office, the Alumni Card is a convenient form of identity that demonstrates your enduring commitment to your Alma Mater and entitles you to selected benefits. New graduates can apply for the Alumni Card online once your status is changed from student to alumni, usually within 1 month after your actual graduation day as indicated in AIMS. 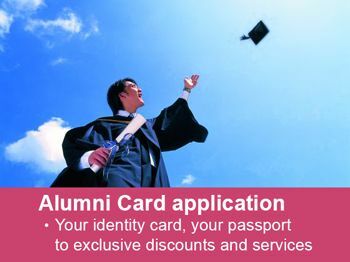 Application fee for an alumni card is HK$50. The fee will be waived with a donation of HK$200 or more to CityU in support of its general development including capital projects. Enjoy the privilege as alumni while contributing to your Alma Mater, apply your own CityU Alumni Card NOW! You can show further commitment to CityU by using the CityU Credit Card for alumni. It is an affinity card offered by CityU and Hang Seng Bank. Part of the total spending from the Principal and Supplementary Cards will be donated to CityU for support of campus enhancement projects and student activities. To learn more, please click here. New graduates can apply the Alumni Card after 15 August on the graduation year. For any enquiries, please contact Miss Leung at 3442 6627 or email to alumni@cityu.edu.hk. © City University of Hong Kong | Alumni Relations Office. All Rights Reserved.